In telling their stories, how far should foster youth go? In the youth-serving community, it has become increasingly popular to ask youth to share their stories publicly. But there are potential pitfalls, not the least of which is sharing too much, too soon. But Michelle Nauman-Brown, Family Design Resources’ youth advocate, isn’t in total agreement with Spagnuolo’s thesis. Nauman-Brown knows from first-hand experience. 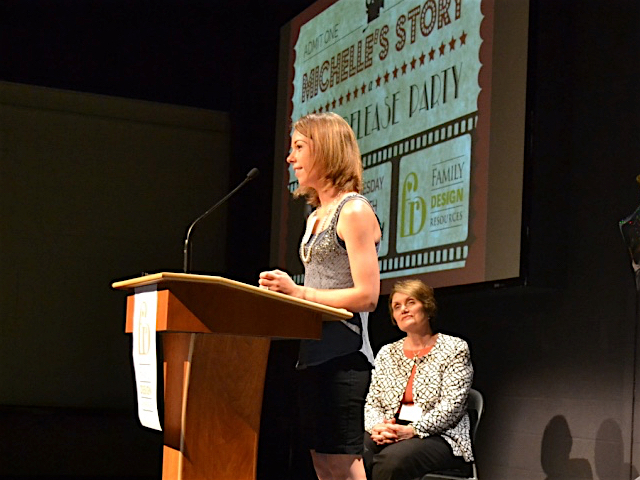 She is the subject of “Michelle’s Story,” an award-winning video that presents a raw, authentic view of her years in the Pennsylvania foster care system. By sharing her often painful story – and lessons learned from her mistakes – Michelle encourages foster youth to seek the permanency that eluded her. In her video, Nauman-Brown (photo, at podium) described how she entered foster care at age 2, separated from her half-siblings; how she lived among 28 foster homes, six group homes, a six-month boot camp; how she found herself pregnant and homeless and lost her own children to foster care for a time. Nauman-Brown said it is important to understand where she has been – and the steep challenges she has overcome – in order to appreciate the important of permanency. It is important to viewers – and to her. Sharing her experience -- including how the resources available didn’t help her find permanency — has opened eyes and, she hopes, will make things better for other youth. Nauman-Brown is passionate about giving youth a voice while they are still in foster care, while their situations still can be changed for the better. She said she wants to empower youth to share and to “own” their stories, to play a bigger role in making decisions that affect them, to help them take more responsibility for their actions. “You will never be able to change the past, but your future is all your own, and if sharing my story will help someone else, I am all for it,” she said. © 2019 Family Design Resources, Inc.